Gunasekhar’s 2003 film Okkadu is a beautifully balanced masala film, full of action and drama with a splash of romance and a dash of humour. Set mostly in Hyderabad’s old city, there is a strong sense of place and community and some lovely visuals. Despite being almost 3 hours long, the pace is just right and the story canters along with barely a pause. The first 20 minutes or so is almost perfection, introducing the hero and establishing his character before the real story even starts and with minimal dialogue. Ajay (Mahesh Babu) is an academic underachiever but excels at kabbadi. He hangs out with his friends and team mates, and has a strong sense of justice if not a strong regard for rules and laws. Seeing a damsel in distress (Bhumika Chawla as Swapna), Ajay must help. And so he draws the ire of crazy baddie Obul Reddy (Prakash Raj) who intends to marry Swapna. Fleeing back to Hyderabad, Ajay tries to help Swapna leave India and also win his tournament. This is another of those songs that could have been shot by the Hyderabad Tourism Commission – it makes the city look so enticing and diverse. I always enjoy watching Mahesh attempt classical influenced choreography. There is an air of determination and faint panic, possibly the result of a dance teacher yelling ‘Shoulders down, elbows up, stop flopping those elbows around, now double time double time double time! Is it paining? Good, then you’re doing it right’. That clip also contains a bit of Maheshian freestyling. No matter how cool a film hero may look, he’s only ever a breath away from uncle dancing. Ajay is a great role for Mahesh. He is heroic in that he does what he sees as right, but he doesn’t have the usual array of super skills. He is just a guy who happens to be handy in a fight. He is a well rounded character, and his family and friends were very much part of Ajay’s life. 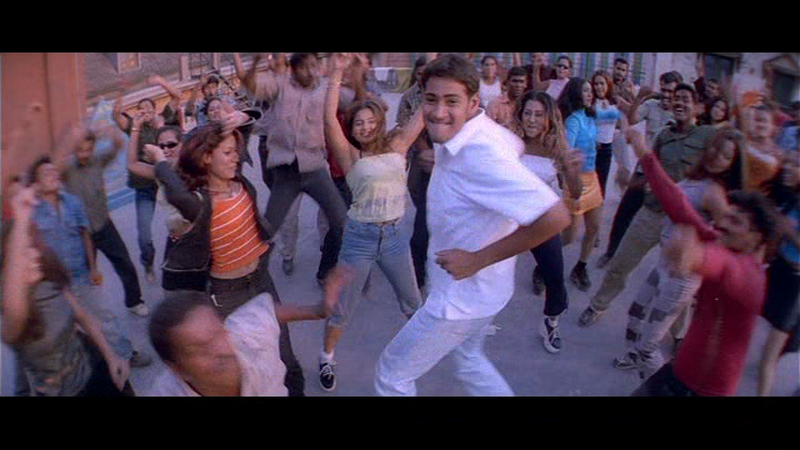 Announced as a Krishna like figure in his first song, Mahesh delivers a lighthearted and fun performance but switches on the intensity when Ajay is on the warpath. While Ajay has Swapna hidden (in his room at home), he does remember to feed her and give her access to a bathroom and he remembers her birthday. So he is thoughtful but he does throw his weight around as all filmi boys do, and there is a slap that sparked a bit of debate between me and The Mahesh Fan. She was not a fan of the slap. I say that anyone who had to put up with Swapna and her poor decision making for so long would not be human if they didn’t want to slap her. No. But for for those who pay attention to such things, there is a lot of elbow on display in Okkadu. 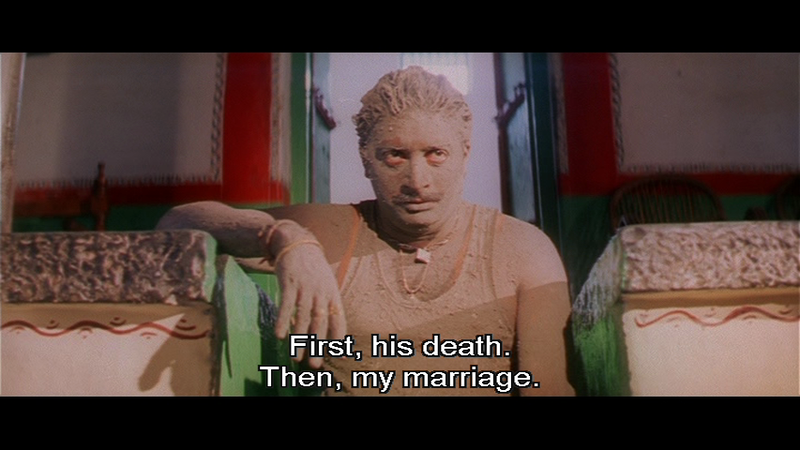 Prakash Raj makes Obul Reddy one of my favourite filmi villains. He is so creepy and wrong, but believes he can charm Swapna despite having killed her two brothers. His obsession with Swapna extends to Ajay, the man standing between him and his love. Prakash Raj plays the romantic lovey-dovey dialogue with a demented flirtatiousness and like Mahesh, can bring the dark side when needed. While his antics were laughable, there was a determination that kept him from seeming a laughing stock. His fighting style was needlessly flamboyant yet got results, much like the character. There are even moments of pity for the bad guy as his mother (the awesomely over the top Telangana Shakuntala) clearly doesn’t think he is always manly or bad enough. Almost everything Swapna (Bhumika Chawla) does is stupid. 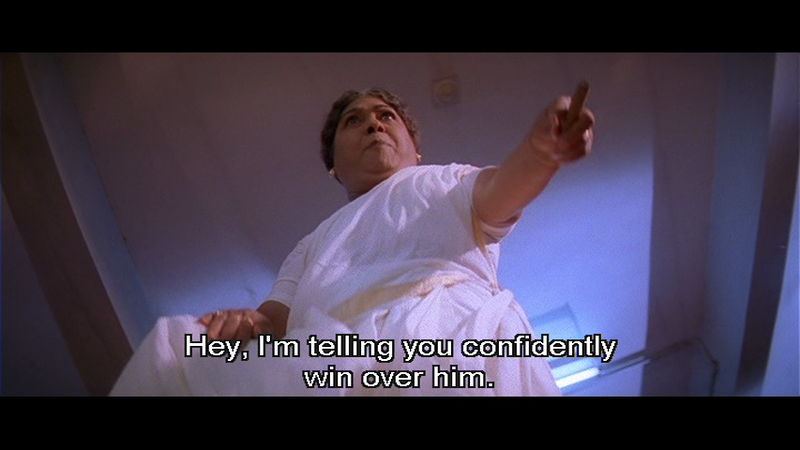 She finally seems to develop a bit of a brain towards the end of the film, her coolness unsettling Obul Reddy (and his rapey plans). But that confidence seemed more to be borrowed from Ajay than due to any of her own qualities. I find Bhumika an indifferent actress and both of her facial expressions irritate me. This isn’t a challenging role but I would have liked to see someone who could add a bit more nuance to their snivelling. Swapna did get a very pretty introductory song, and I could ignore Bhumika and concentrate on the tiny birds fastened to the set (and her) and the lovely scenery. Mani Sharma’s soundtrack and songs work so well in Okkadu. The songs are mostly nicely picturised and generally help the story or character development to emerge. And there is a lot of dancing so that is a plus in my book. Gunasekhar makes good use of the background score and ambient noise from the scenes, with the tempo of street sounds heightening the intensity of the action. Even Obul Reddy gets a theme that is memorable and perfectly daft. The fight scenes are energetic but not too gory and I find them very entertaining. There are some nice visual set pieces that mirror other events or highlight the difference in characters too. The old chestnut of justice vs. what is legal was given a slightly different treatment here. The ever authoritarian Mukesh Rishi plays Ajay’s dad, a senior policeman. He is out to capture a kidnapper, while his son is out to save Swapna. The priorities and conflict are clearly shown but not in too heavy handed a manner. Political corruption and the lack of independence of the police force are also shown up but it almost happens in passing, with little tub thumping about causes or society. The ensemble scenes are particularly good. Ajay’s mum and sister (Geetha and Baby Niharika) are less than reverent towards the son of the household and I liked their teasing banter. Ajay had a large group of friends and team mates and at critical times they stepped in to help him and give him information he needed to carry out his plans. I even laughed at some of the comedy dialogues, more because of the excellent delivery than the lines, but it is unusual for me not to look for the remote when I spy a comedy uncle. Okkadu has it all without having too much of anything. Gunasekhar directs another excellent performance from Mahesh and the balance of serious and silly is bang on. Full on entertainment that won’t leave you feeling like you’ve been hit by a truck. 4 ½ stars! 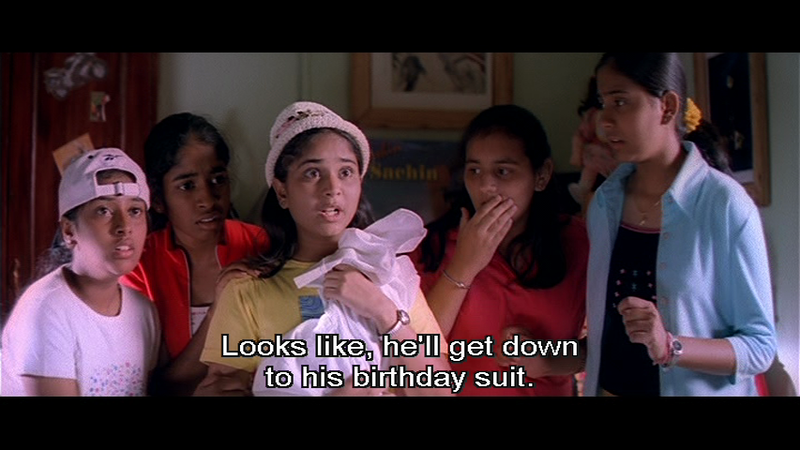 (deduction for Bhumika and her woeful expressions of woefulness and some dodgy CGI). This entry was posted in Tollywood and tagged Baby Niharika, Bhumika Chawla, Geetha, Gunasekhar, Mahesh, Mahesh Babu, Mani Sharma, Mukesh Rishi, Okkadu, Prakash Raj, Telangana Sakuntala, Telugu. Bookmark the permalink. This is one of those movies which has everything going for it. > Mahesh Babu has established himself as a bonafide movie star with this flick. Sure he had some hits earlier, but through this movie he “found his footing”. He looked so at ease before. > Prakash Raj was phenomenal. There cannot be enough words said to describe his performance. 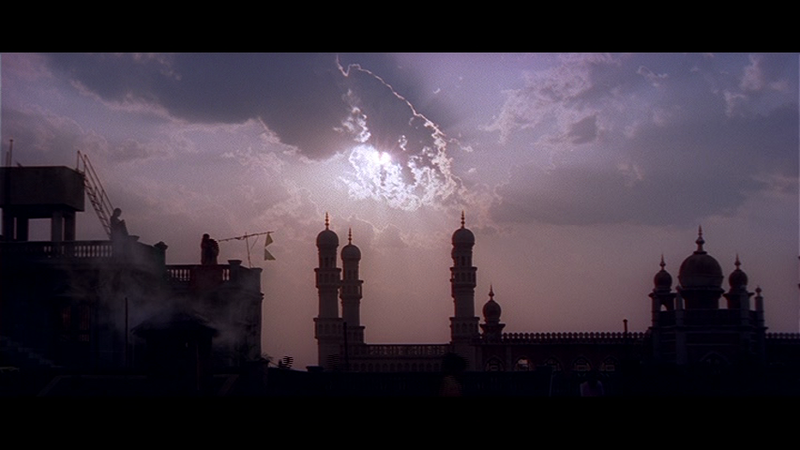 > Manisharma was in a good touch; the BGM and the soundtrack always felt in place. > Gunasekhar was in his senses during this film, I guess. He didn’t get carried away like in most of his films (Mrugaraju, Varudu etc.). Script was a routine one but the key was implementation in the form of screenplay and direction. There are some scenes which will come to minds of the audience when this movie is mentioned for a long time to come. > Bhoomika was alright in the way she brought vulnerability to her character. The remaining cast was good and credible within their parameters. I felt that Gunasekhar is a talented film maker but he failed to make an impact like this in any of his later works. Hope there are some better works of his in store for us. I love this movie and agree that the first 20 minutes is pretty much perfect. I can’t believe this but I am going to defend Bhumika. Whilst I am not a fan and find her generally insipid, Swapna has been repeatedly traumatised so I think being helpless and snivelling was forgivable given she was likely to have been in shock. That said, I probably would have preferred a different actress though I vote no for Trisha. I always think she looks as though she loves herself more than she loves Mahesh in the films they have been paired in and seriously, how much acting skill should it take to act being in love with Mahesh? As for the slap. I have no problem with thinking longingly about how you might like to deliver a tight and well placed slap but ultimately think it’s best if you don’t act on the urge. And poor Swapna was only trying to do the right thing and say thank you so in my book even though she had been stupid, was still a a post trauma state and therefore prone to do things without thinking clearly. And a slap of love is still a slap. That said, this momentary blip doesn’t diminish my love for this movie in any way. The music and picturisations are excellent too. Can anyone tell me what is the Hindi song played by Mahesh Babu’s sister when they were dancing in the beginning of the Okkadu movie?